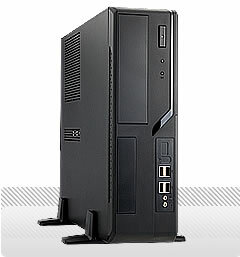 * [http://www.in-win.us/products_pccase_series.php?cat_id=1&series_id=44&model_id=245 BL647] - A small 11.5L SFF chassis with optimal thermal and acoustic performance without additional system fan. This page contains a collections of nice cases which can be used when building MythTV systems. Silent PC Review has reviews of many cases. See REVIEWED NON-TOWER CASES for horizontal cases, such as HTPC cases. Overture II: ATX and MicroATX — Be aware, this case makes it very difficult to replace the power supply should something bad happen to it. The power supply may have issues and generate noise on the PCI bus under moderate to heavy load, causing reception problems on some tuner cards. Antec Fusion - Fusion — A beautiful case with solid aluminium front with imon VFD and volume control included. Comes with very quiet power supply and Twin nearly silent 120mm case fans. See the LCDproc page to set up the VFD under linux, and the Volume Knob on Antec Fusion page to get the volume control working with lirc. Micro ATX only. New Solution NSK 2400 Like the Fusion, but without the integrated iMon. Micro ATX only. New Solutions NSK 2480: updated version of the NSK2400, with a more efficient (and therefore quieter) power supply. Excellent for a frontend. Like the Fusion, but without the integrated iMon. Micro ATX only. Aria is a 13"d × 10"w × 8"h mATX case with all aluminum frame and 120mm main fan. It has been replaced by the steel-framed case, NSK1300. The NSK1300 has in-turn been replaced by the updated NSK1380. BL647 - A small 11.5L SFF chassis with optimal thermal and acoustic performance without additional system fan.